Why is the Roman Catholic Church so fond of depicting Moses with two horns on his head? Isn’t that a bit… diabolical? The horned man is a symbol of Pan, an ancient satyr god—half man, half animal—ruler during the “Golden Age” in classical antiquity. Saturn (Kronos) is the same as Pan; furthermore, the word “satyr”, referring to a he-goat, comes from the word “Saturnus”, identifying the Greek “Kronos” with the horned god Pan. The son of Kronos (Saturn) was Zeus (Jupiter). In mythology, he was slain by his own son and usurped as the chief god. Saturn is often depicted as devouring his own children as soon as they’re born in an attempt to prevent the fulfillment of a prophecy that said his own child would one day overthrow him. A Vedic god called “Mitra” was worshipped not only in Persia, but as “Mithra” by the Greeks and Romans as well. In fact, Mithra was often worshipped in temples of Jupiter, and vice-versa. Why? Because they were the same god. Mithra is commonly depicted slaying a bull, symbolizing how Jupiter killed his father, Saturn. This is because Saturn’s ancient Semitic counterpart was the deity El, who was symbolized by the bull (Taurus), again denoting a horned god. It is also theorized that “Kronos” (Saturn) means “the horned one”, as it may be derived from the ancient Semitic word “qrn”, meaning “horn”. 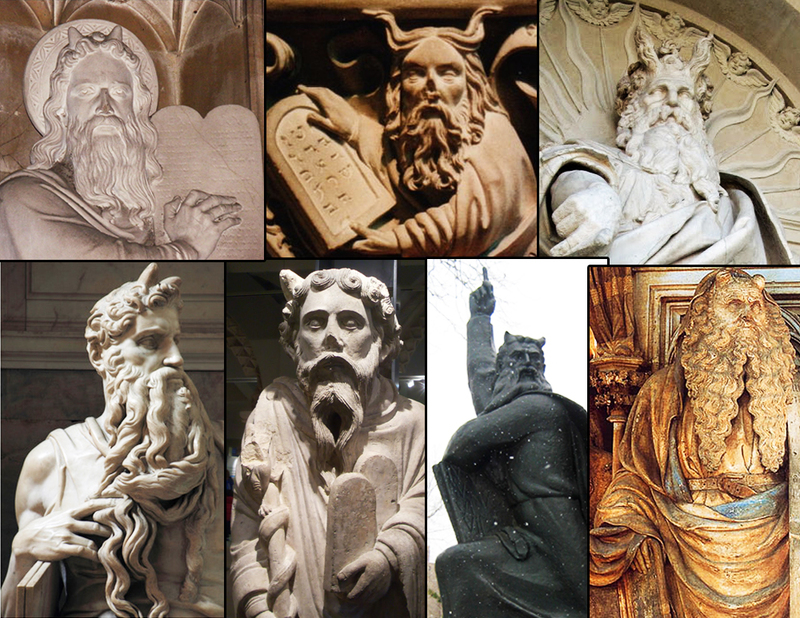 So, why does the Roman Catholic Church have a long history of depicting Moses as the horned god? Most of the artwork portraying this is from after Rome’s supposed conversion to Christianity, yet still, they prefer to deliberately depict Moses as Saturn. In Hesiod’s poem “Theogony”, the Golden Age of Kronos/Pan was said to have been lawless, since there was perfect harmony with no immorality to demand rules. However, after a major war between the Titans and Olympians called the “Titanomachy”, Kronos lost the battle to Zeus. In Virgil’s Aeneid, it’s said that Kronos then escaped to Latium (the region in Italy that became Rome). It is here that he then ascends as king and law-giver. Obviously, this account of Kronos’ identity as king and law-giver was more popular in Rome (Latium), since Latium is where he established his kingdom after the Titanomachy. 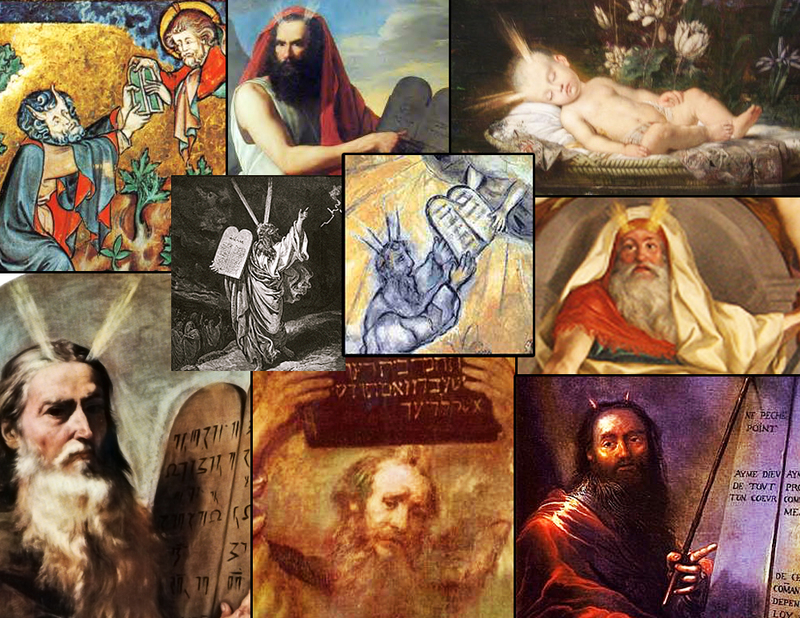 Many artists, commissioned by the Roman Catholic Church, portrayed Saturn/Kronos/Pan as a religious tribute, calling it “Moses” to disguise its true identity from the Christian masses. Since both Moses and Saturn were considered “law-givers”, the similar imagery made this an easy deception. The truth, therefore, was hidden in plain sight, known only to those who were educated in the mysteries of classical antiquity. The Roman Catholic Church has always honoured the ancient mystery religion of Babylon, Egypt, Greece and Rome, but in secret, so as to maintain their power and authority in a country primarily occupied by Christians. Rome was already being overthrown by the Christian masses at the time that Emperor Constantine had his self-professed “conversion to Christianity”, so it appears to have been more of a political gambit to prevent Rome’s disempowerment at the hands of Christians. Pagan Rome, therefore, continued to worship the ancient pantheon under the guise of Christianity. Depicting a horned Saturn and calling him “Moses” is one very prime example. Many of the Catholic portrayals of Moses depict both a sun disc and two horns on his head. Also consider that many members catholic church believes that Jesus and satan are basically one in the same.. just one rules light and one darkness.. the way they see it they are equal becuase one couldn’t exist without the other… (this is at least true for those who are involved in the secret societies within the church that believe in the occult/mystery religion/new age stuff, I believe most catholics are probably just well meaning but apostate people.) which is how you end up with a mafia which is mostly roman catholic, I’ve seen pictures for instance online where a mafia crime leader was busted; and they showed one of his pistols which had scripture quoted on it! They believe since they are part of ‘god’s one true chuch’ they must be doing ‘god’s work’ and he will ‘sort out’ the souls of those they silence. Such is how the inquisitions/crusades/etc came to pass in the name of “christianity” but satanism has always existed in these groups if you study the history of the knights templars for instance. And another point as it relates to your post on the parallels between moses/saturn in regards to better understanding the big picture of relationship, which I also find fascinating, is that the Roman Catholic church is essentially a church of works salvation… so I can see how that end up with them having to reject the true son of God, essentially reducing him to the the same status as satan, and a subsequent worhsip the law of moses; which ‘brings them their ‘salvation..’ I think that’s why we see these high profile people who are into pedophilia, ritual blood sacrifice etc, also making huge monetary contributions to certain causes etc. They think they’re ‘good’ will outweigh their ‘bad’ and whatever they ‘have to do’ is ultimately god’s will and part of his plan…..
At least this is at least what I understand their beliefs to be based on doing a lot of reading in comment sections/forums/talking to people/studying history/alleged eye witness accounts/etc. Now I’m going to share something real heavy with you as a brother in Christ. I think you need to see this as it shows how real the evil is today, how far its gone and is a sign of the times we are living in; most of all your prayers are needed.. you will understand. But I also believe that general public exposure is necessary if anything is going to be done about it. I’m about to share a link with you I stumbled upon on a forum called GLP (perhaps your familliar) http://www.godlikeproductions.com (direct link to the particular thread im reffering to at http://www.godlikeproductions.com/forum1/message2787479/pg1).. and it contains the testimony of two brave little souls from somewhere europe I want to say, who look to be about 8-9, who are opening up on camera about witnessing human sacrifice of babies, being sexually absued, etc.. and they say that the churches, the police, their teachers etc are all in on it. It’s horrific and and first I even questioned the authenticity of it but I believe the reason they are able to speak so nonchalantly about it is because they’ve been ‘normalized’ to it and probably also have ‘PTSD’ etc. There are several videos at the link below, I have no idea anymore information than what I’ve shared with you. I would suggest looking around on the GLP thread linked above for more info. I’ve spent all afternoon on me knees and crying/greiving about this. I believe the system is so corrupt the only way for change is for God to either ‘bring the scum to the surface’ so to speak so it can be removed, or to finally fulfill his plan and bring in the great tribulation and finally establish his kingdom.. but in either case I think it’s so important we are praying and crying to God about this stuff. Another thing I’m going to share with you is something that the Lord just made known to me.. is the fact that this man Kent Hovind who apprently had a ministry, and was really into debating atheist/evolutionists has apparently been locked up in prison for the past 8.25 years… I also became aware of this through a thread on GLP that was ‘pinned’. I had recognized the name from a testimony he gave on speaking to Ron Wyatt in his last days about his discovery of the ark of the covenant (https://www.youtube.com/watch?v=9ay1vFfkji8).. (also check out the ron wyatt ark of the covenant documentaries on youtube if you have not. They are fascinating and reveal new prophetic meaning of the scriptures..
Anyways upon further research it seems he may of been involved with the vatican/council of world churches/etc at one time but decided to go against him.. there are videos of him on youtube exposing a lot of truth about the ‘new world order,’ illuminati, masons, etc, of course he never takes it all the way to rome/jesuits (at least that I’ve seen yet) which is one of the numerous reasons why I suspect he was involved…. anyways you can find phone interviews with him from the last year (https://www.youtube.com/watch?v=eabs2fshfEc) and it sounds like he was wronged and tried to comply legally from the beginning, like perhaps he was setup, and perhaps it was becuase he ‘pissed’ the wrong person off. Well hopefully that’s not to heavy for you; but God put it on my heart to share with you. If you don’t remember me, I posted in the comment section on one of your blog posts before and think had a very minor conversation with you.. anyways if you ever need prayers, advice, or just wanna chat w/e hit me anytime. Glad to see your site is still up; and that your still alive, apparently well, and posting.. my website which I had hosted on freewebs actually got shut down. Only the one (of 2 or 3 on the same account) that was exposing the evil ‘conspiracies’ and preaching the gospel of course.. I lost quite a bit of work but God has been taking me new places and using me in new ways so I guess it’s all just as well. Anways, God speed friend. Peace. Excellent points, Steve. I love the feedback. I’m in extreme agreement, and only a few hours ago, I myself saw that video of the two children you mentioned. Incredible—but not unbelievable. also might want to consider adding a ‘gospel’ or ‘how to be saved’ up at the top along with home/about With scripture/simple bsound iblical instruction etc.. if you need ideas/scriptures let me know.